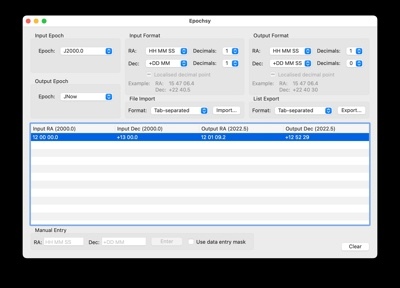 Epochsy is a small application to convert RA/Dec coordinates to different epochs. Epochsy is Freeware. Use it at your own risk. If you would like to support my astronomy obsess..., er hobby, and feel this application has some value to you, I always gratefully accept donations. Creating software like this requires lots of time and expensive software and equipment. Note: Although Epochsy is freeware, please do not post the files anywhere else without permission. Feel free to point anybody at this page or publish the URL publicly. ** This is a ZIP file. You can uncompress it with one of several utilities. We recommend WinZip.